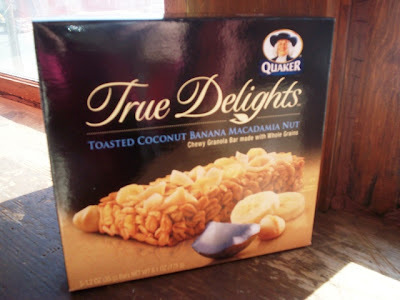 New England Bites loves to try new things, so when Mom found a coupon for Quaker's new True Delights granola bars (regular price $3+), we just had to buy a box. The toasted coconut banana macadamia nut flavor caught our eye, so we tossed it into our grocery cart and headed for the register. I often bring granola bars to work with me while Mom snacks on them at home, so we were looking forward to having a bar that featured three of our favorite flavors. THE VERDICT: Delish! It was a bit chewy because of the enormous amount of oats, and it had a very strong banana flavor which seemed to override any hint of macadamia nut and coconut. The bar had a light glaze on top that didn't make it overly sweet. All in all, the Quaker True Delights bar had a different flavor from other granola bars, which seem to all taste the same after eating them for so many years. We look forward to trying some of the other flavors.